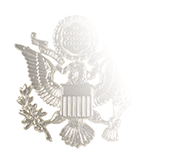 Our silver tie tack or tie clasp is designed for wear with the black four-in-hand tie that was part of the Petty Officer First Class Winter Blue uniform. 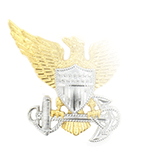 Both the tack and clasp feature the same insignia employed as the cap device on the Garrison Cap, Ball Cap, and Eight-Point Hats without embroidered ACE (Anchor, Constitution, Eagle) logs, a perched eagle with outstretched wings over the three chevrons indicating the E-6 pay grade. In 2003, the Navy chartered Task Force Uniform to assess uniform regulations in an effort to modernize and streamline uniform requirements. 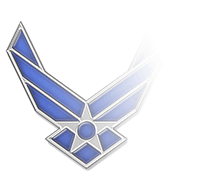 Based on TFU recommendations, in 2004 the Navy eliminated seven types of uniforms including the Winter Blue, in spite of the fact that seventy percent of personnel surveyed by TFU were either satisfied with the Winter Blue uniform or were neither satisfied or dissatisfied with it. With the removal of the Winter Blue uniform, male Petty Officers First Class (and all male Sailors in lower rates) no longer had a uniform that featured a necktie at all, and subsequently all references to tie tacks or claps for enlisted personnel were removed. 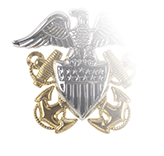 Our Petty Officer First Class tie tack / tie clasp is manufactured to conform to Navy regulations at the time their wear was permitted. 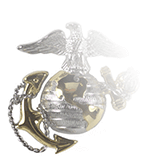 We offer it for veterans who wish to maintain their uniforms in accordance with the regulations under which they served, as well as for collectors, re-enactors, and media companies (TV and motion picture) seeking authentic appurtenances for their productions.